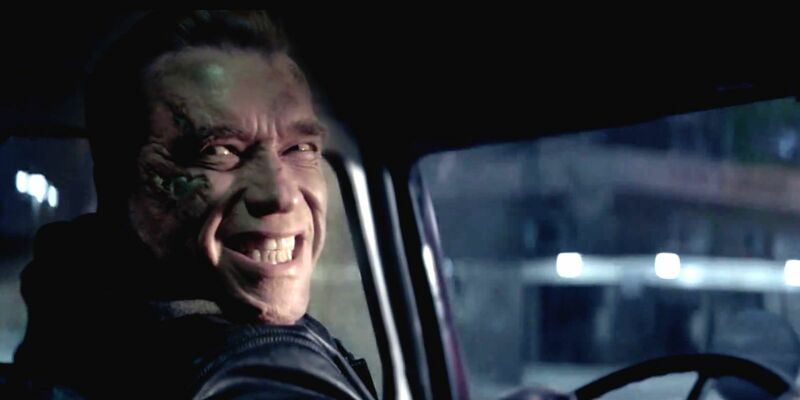 Well, I guess all I can say about “Terminator Genisys” is thank god Arnold Schwarzenegger is back! “Terminator Genisys” is part sequel, prequel, remake, and reboot of the “Terminator” franchise, featuring a new timeline. The talented Jason Clarke (“Dawn of the Planet of the Apes” (2014)) is now the fifth actor to play John Connor and the film begins with him defeating Skynet. However, he still needs to send Kyle Reese (played by a very whiny Jai Courtney) back to 1984 to protect Sarah Connor (now played by Emilia Clarke of “Game of Thrones” fame). When Reese arrives, he discovers that Sarah is now the strong warrior she’ll later become in “T2” (1991) and she has a T800 (Schwarzenegger) nicknamed “Pops” by her side. They assemble Reese to change the future, but Reese discovers there’s a potential new result of Judgment Day in 2017 instead of 1997 (the date of Judgment Day in “T2”). You know? I didn’t like “Terminator Genisys”. It’s not a bad movie, but like “Terminator 3: Rise of the Machines” (2003) and “Terminator Salvation” (2009), it wasn’t needed. “Genisys” isn’t redundant stupidity like “T3” or uninspired like “Salvation”, but it suffers due to poor casting choices and unnecessary complications. Jai Courtney is unbearable as Kyle Reese, delivering an uninspired and clueless performance; he clearly went into this movie without researching Kyle Reese or Michael Biehn’s portrayal of him. Jason Clarke is a solid actor, he gives a very mixed performance as John. He overdoes the cliched philosophical warrior in the first half of the movie before going bonkers in the second half. Emilia Clarke is good as Sarah Connor, but she doesn’t have any chemistry with any of the other cast members here. Not sure if it’s her fault or not. Remember when I said it’s complicated? I’m not kidding. “Terminator Genisys” tries the “X-Men: Days of Future Past” (2014) play by erasing the flaws with a new timeline and misfires! The new timeline is incredibly confusing and features a very unnecessary and bizarre remake of “The Terminator’s” (1984) opening ten minutes, a theory that time travel can create memories of your unforeseen future, and an unresolved subplot involving Matt Smith (“Doctor Who”). I can forgive some of these flaws due to Schwarzenegger giving the Terminator a touch of protective father and badass old man. He also remains incredibly funny throughout a majority of the film, which was refreshing. Speaking of funny, the wonderful JK Simmons kills it as a bumbling detective caught in the middle of the plot. The action and visual effects are exciting, as well, though will never compare to “T2’s” epic action sequences. I mean, if you’re a fan of the “Terminator” franchise, you might be entertained, but ultimately, it’s another missed opportunity.